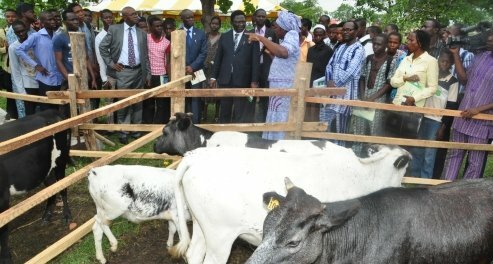 The Ogun State Governor, Senator Ibikunle Amosun, has appointed four Professors from the University of Agriculture, Abeokuta, as chairmen and members of Visitation Panels to some state-owned tertiary institutions. The Moment newspaper of Tuesday, September 13, 2011 revealed that Professor Olusegun Osinowo, the University’s Director of the Institute of Food Security, Environmental Resources and Agricultural Research (IFSERAR) was appointed Chairman, for the College of Education, Omu, while Professor Francis Bamiro of the Department of Chemistry heads the Panel for the College of Health Technology, Ilese. Others are, Professor Caroline Afolami, Director, Agricultural Media Resources and Extension Centre (AMREC) and Professor Tope Popoola, Dean, College of Natural Sciences, who were appointed as members of the Panel for the Tai Solarin University of Education, and the Ogun State ICT Polytechnics, in Ijebu-Igbo, Saapade, Igbesa and Itori, respectively. The Panels are expected to assist in ascertaining the state of affairs of the institutions, for efficiency and better service delivery.